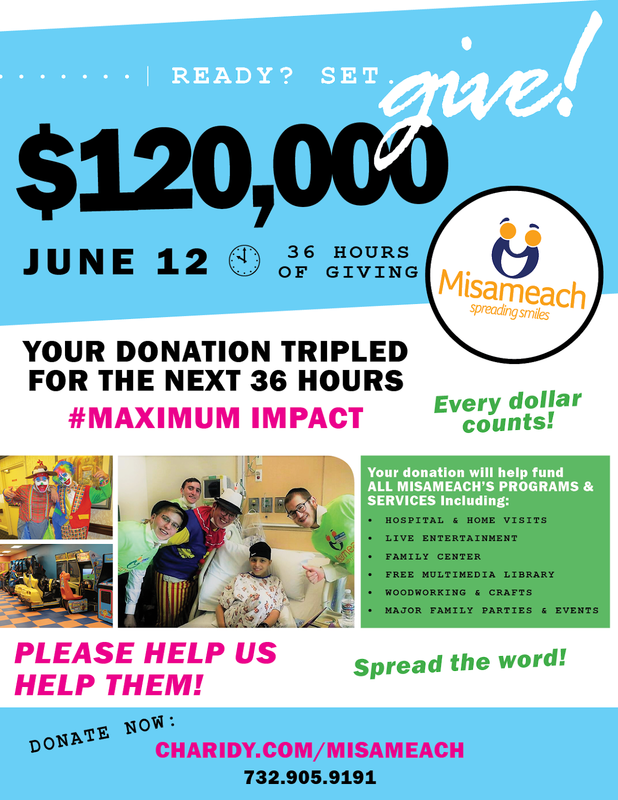 Misameach is an organization dedicated to bringing joy, hope and encouragement to very ill children and young adults across the country. Our many programs and services include live bedside entertainment in hospitals and homes with music, clowns, jugglers, superstar singers and more! We also offer multimedia libraries for patients, gifts, Cruises, major events, and a new, stunning 3700 square ft. Family Center! the opportunity to fight my illness". Now's your opportunity to be there for these children! For 36 hours ONLY, donations received to our campaign will be TRIPLED, maximizing the power of every dollar you give. Please DONATE NOW so that we can continue our vital mission! Every penny you donate is TRIPLED! For every dollar you give, Misameach will get $3. Every dollar will be matched by our generous benefactors, to help us reach our goal of $120,000. Click Here to Watch Misameach Spreading Smiles. Remember: The campaign is our ONLY CHANCE for every dollar to be tripled – we must raise the full amount! Your support will allow us to ENSURE that Misameach will be able to continue spreading smiles to ill children across the country!